The detox continues with more green vegetables and today I choose brussels sprouts. I think brussels sprouts get a bad wrap. They have the stigma of the vegetable you feared your parents making you eat, or worse still, a vegetable so bad your own parents wouldn’t dream of forcing it on their children. People seem to think brussels sprouts belong in the same food group as buttermilk, radishes, pickled eggs and liverwurst — a.k.a. food only people who lived through the depression eat. This is only true if you chose to boil and overcook your brussels sprouts without any seasoning, thus leaving your kitchen smelling like senior housing. Brussels sprouts get a bad wrap because they’re generally not cooked right. First of all, never, ever, ever, ever get the frozen ones, even if they say they come in a butter sauce. No amount of frozen butter is going to make that taste good – get fresh ones. Second, don’t boil or steam them. Something that already smells funny is made worse by being soggy and squishy. You know what we do to vegetables to make them taste right? I already told you yesterday : we fry them! 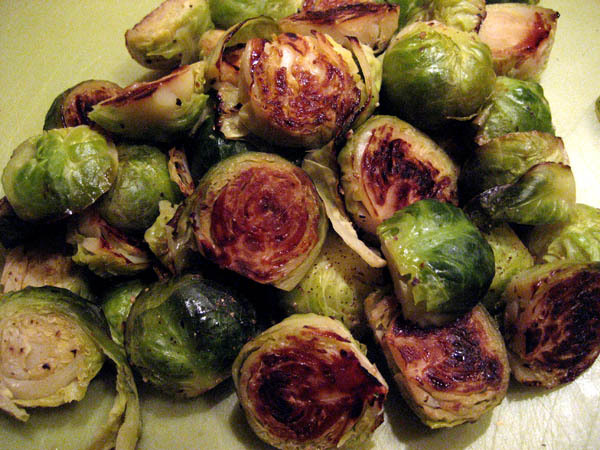 The moment I had brussels sprouts with a crisp brown char to them was the moment the mystery was unlocked. From that point forward I could eat bowls of brussels sprouts on their own (usually with a little bacon for good measure). Even though this recipe doesn’t require you to cook the brussels sprouts, I knew I’d prefer the taste more if I did. Feel free to do as you wish, but if this is your first go around with brussels sprouts, then I highly recommend you cook the sprouts first. I love the simple dressing in this recipe. If you don’t have apple cider vinegar or dijon mustard, it’s worth stocking the pantry (and both of those items are generally $3 or less). 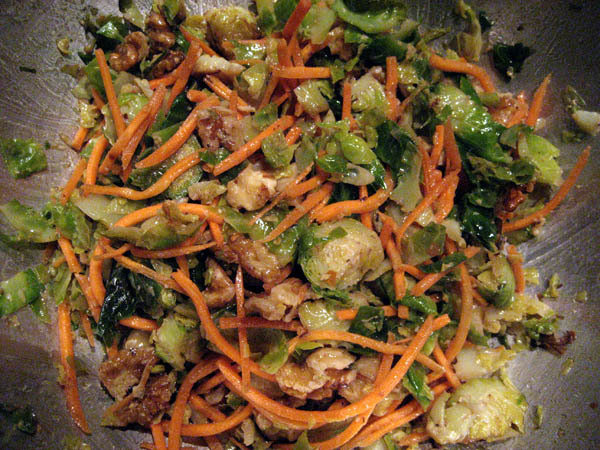 The original recipe is called “addictive brussels sprouts salad,” and I kid you not it is and I think its because of the dressing. The walnuts add a nice crunch and I also like to throw in matchstick carrots for the same reason, plus added veggie value and color. If you want to make this salad healthier still — and vegan for that matter — you can leave out the parmesan cheese. I’ve gone without it a couple times and I don’t notice much of a difference. When I make this, I toss the whole salad with half the dressing and then add a bit more to the serving I intend to eat. The rest goes in the fridge and, again, when I want some more I’ll toss with the extra dressing. I’ve nearly eaten the entire serving in one sitting before. It’s occurred to me that brussels sprouts also have a bad wrap because their name is confusing. Brussels is in fact supposed to be plural, but when you say it in conversation, nobody ever says the ‘s.’ It is also supposed to be capitalized like the country – but I say shucks to that. I’m making my own rules. It’s a vegetable, not a country. Just because the sandwich is named after the Earl of Sandwich, doesn’t mean I have to capitalize it each time. Wooo! The cheap thrills of a rebel journalism grad. Clean the brussels sprouts by running them under cold water and removing the outer leaves. Cut each sprout in half. Heat olive oil in a skillet over medium-high heat. Place sprouts cut side down in skillet. Let sit for 10 minutes, until a deep brown char develops. Add water and cover for 7 – 10 minutes, until water is almost evaporated and fork can pierce the sprouts easily. Set sprouts aside and allow to cool to room temperature. 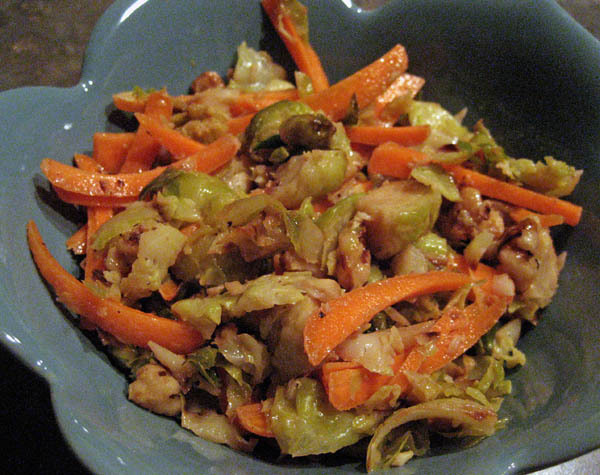 Roughly chop cooled sprouts and toss with cheese, carrots and walnuts. In a small jar or bowl, combine olive oil, apple cider vinegar and mustard with a sprinkle of salt and pepper. Shake until well mixed. Add more mustard, vinegar or salt and pepper to taste. Pour the dressing over the salad and stir thoroughly.